Wire flows in the blood of Mary Fitzgerald and her brothers, Mike Planeta and Edward Planeta, who run Acme Wire Products Co., Inc., a 48-year-old precision wire fabricator in Mystic, Connecticut. That same wire seems to run in the blood of Linda Froehlich and Richard Froehlich, co-owners of Ace Wire Spring & Form Co., Inc., of McKees Rocks, Pennsylvania, and their son, Ritch Froehlich, the general manager of the company. Mary, Mike, and Edward’s grandfather founded a company called Artistic Wire Products in the New York area in the 1930s, and later, their father, Edward Planeta, managed his father’s factory. After Rudolph Planeta sold Artistic Wire in the late 1960s, Edward Planeta opened his own company, Acme Wire Products Co., in 1970 in Norwich. He moved it down the road from Norwich to Mystic a few years later, and his children joined the firm after working in other occupations. The third generation now runs the tight-tolerance precision spring and wire fabricating firm. While grandfather Rudolph Planeta specialized in household items, including napkin caddies and dishware, his grandchildren make more complicated parts for a variety of industries, including medical, instrumentation, safety, sports, construction, premise wiring, custom material handling, and others. “We’re focused on precision applications,” Fitzgerald said. That, along with automation, appear to be two wire industry trends, said David Padgett Sr., president of the national Wire Fabricators Association (http://wirefabricators.org/). A third spring industry trend is a stubborn problem with finding people to work in manufacturing. Both Ace and Acme, as well as Padgett, said that finding workers is difficult and that automation is important because it takes the place of workers who are not in the factory. Other trends include green manufacturing, which industry supports for many reasons, including the goal of saving money by not over-producing or buying too much raw material. In addition to agreeing that precision, automation, and a worker shortage are spring industry trends, Joshua Kahn, president of the Chicago Association of Spring Manufacturers Inc., said two other industry trends are also underway. One is rising material costs. The second is the insistence by large customers that suppliers, including spring makers, lower their costs every year, in some cases by 5 percent a year over a five-year contract. Springs are made from spring steels, which are alloys that start with iron and small amounts of other elements, including carbon, silicon, manganese, and chromium. The varying amounts of each component and the final composition determine the spring’s final properties, including how many times it can be compressed or stretched, its ability to work in a hot or cold environment, what corrodes it, whether or not it conducts electricity, and how hard it is to shape. How long will it last? Springs require finishing operations, in many cases—finished shaping, passivation, heat treatment, and others. Kahn said prices were rising before any tariffs went into effect, and manufacturers started losing money. Not everyone had a clause in their contracts that let them raise prices for parts if raw material costs rose. Prices had been stable for a long time, so the clause wasn’t necessary. Adding to the challenge for suppliers, said Ace Wire Spring & Form’s Linda Froelich, is that they sometimes don’t receive payment from larger companies for up to 180 days. The other trend, asking suppliers to cut costs each year, might make sense in a huge manufacturing setting, like assembling a car, but spring manufacturing isn’t like that, Kahn said. It’s simple. A wire is fed into one end of a machine, and a finished spring falls into a box on the other end. A wire, a machine and a person. Not a whole lot of room for cutting costs. Perhaps 2,000 pieces drop into the box every hour. A five percent improvement would raise that to 2,100 springs. Kahn said finding workers has been difficult for 20 years, but it got horrible in the last three to five years. New machinery, tighter tolerances, and a strong economy are keeping his association members busy. Fitzgerald makes a distinction between a wire form and a wire fabrication. A wire form is a single wire that Acme shapes to the customer’s dimensions. Wire fabrications are wire assemblies made up of numerous wires that Acme shapes to the customer’s specifications and then assembles, frequently welding them together. A lacrosse helmet face mask is a wire fabrication. Among Acme’s many products is a light-weight wire basket shaped and welded together in 0.08-inch stainless steel that physicians use to hold and sterilize their iPADs with ultraviolet light before entering a patient’s room. The tray is assembled from about 20 wires. Acme manufactures wire forms from low carbon steel and stainless steel in diameters of 0.06-inch to 0.5-inch. Assemblies may include sheet metal, wire, and tubes. 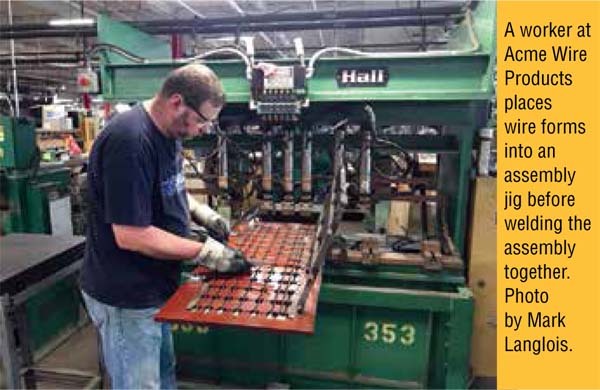 Manufacturing processes at Acme include wire straightening and cutting, sheet metal stamping and blanking, bending, forming, machining, piercing, and threading. The company also offers coining, tapping, swaging, notching, CNC stamping and forming, reaming, drilling, and various welding processes. Hardware insertion, electrostatic powder coating, fluid bed coating, assembly, kitting, and special packaging round out the list. Acme invests in new CNC wire forming equipment that forms the wires, and in other machines that weld them together. 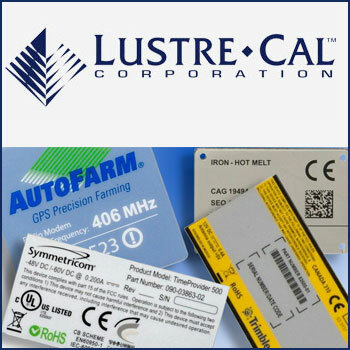 The company relies heavily on CNC equipment to maintain and improve the quality of its products and the efficiency of its manufacturing processes. Acme’s tool shop makes the company’s tools. It also makes some of the unique wire shaping machines that Acme designs and manufactures in-house to meet customer and product needs. Among the company’s many fabrications are lacrosse helmet face guards. These contoured and welded parts are hand assembled, and, when in season, Acme makes four or five models up to 20,000 masks a month. The masks come in various colors, and Acme has manufactured roughly 2 million to date. Acme (https://www.acmewire.com/) supports numerous local and national charities, including the Pawcatuck Neighborhood Center, the Mystic Area Shelter and Hospitality Emergency Shelter, the St. Vincent de Paul Place, the Riverfront Children’s Center, the Haitian Health Foundation, and the Ocean Community YMCA, among others. Among the processes not available to Rudolph Planeta in the 1930s was robotic welding. In one case, Acme Wire Products programmed CNC machines that made a brush cutter part from low carbon steel with a plated zinc finish. The program included 10 bends, more than 30 feeds, and two end-loops with different angle configurations that required numerous automated operations. The CNC program tells the machine to feed the wire out, pick a tool, bend the wire, feed it out, rotate it, bend it this way, feed it, turn it, bend it that way, feed it out, bend it again. Using the CNC programming to tell the machine what to do is part of Acme’s expertise. Once the design and first parts are OK’d, the big numbers ship. Now Acme ships 10,000 brush cutter belt guides when requested, several times a year. It takes knowledge and equipment, specifically CNC controlled wire forming machines, to make precision products. That means the company’s staff work on training and learning new skills that new products and machines require. “Some skills are developed internally in response to customer demands,” Fitzgerald said. Out in Pennsylvania, also in the 1930s, Ace Wire Spring & Form Company jumped out of the spring manufacturing starting gate from an upstairs window. It’s also a family story because Linda Froehlich, her son Ritch, and her husband, Richard, carry on the work started by Linda’s father, Joseph Vodvarka, who set up his first coiling machine in the attic of his home in 1939. His first customer was Rockwell Manufacturing, supplying them with garter springs. When he entered the Air Force in World War II, Linda’s grandfather and grandmother continued the business until his return. Ace Wire Spring & Form traveled 79 years since its founding, but only a few miles from attic. It traveled generations, however, from its first coiling machine. To improve quality and remain competitive, Ace invests in new CNC machinery. Ace’s most recent investment was a Taiwanese wire shaping machine that allows Ace to create springs from finer wire, going along with industry trends toward smaller springs. Ace operates other manufacturing equipment that allows it to shape wire that is more than a half-inch thick, Linda Froehlich said. Ace Wire Spring & Form specializes in design assistance. Ritch Froehlich, son and the general manager, wrote the design guides “Proper Requirements of Spring Design,” and “Spring Design 101,” to help the company’s customers with their spring designs. Ritch Froehlich urges spring designers to answer those questions, including the environment where the spring works. That could be excessive heat, or in salt water, moisture, or chemicals. Grade T-302 Stainless steel is one of the most common steels with a chrome nickel base used in aerospace, automotive, and construction industries. The spring and wire form business was good for Ace. It outgrew Joe’s house in 1955, when he opened Ace Wire Spring in its first standalone facility a few miles from the Vodvarka home. After the founder decided to retire in 1976, his daughter, Linda, and her husband, Richard Froehlich, bought the company. About 10 years later, they expanded into a new 55,000-square-foot facility, where they employ 50 people, less than five minutes from the old office. Ace works with customers in numerous markets, such as agriculture, off-road equipment, medical equipment, military, appliances, valves, actuator & regulatory springs, energy, electrical power generation, rail and transportation, gas and steam engine, oilfield drilling & mining, as well as mining and material equipment, snow removal equipment, and shock and vibration control. Each type of spring has its own characteristics, whether it is a compression, an extension, or a torsion spring. Ace Wire Spring & Form (www.acewirespring.com) manufactures a wide range and variety of numerous spring types, including compression springs (such as shock absorbers), extension springs (for screen doors), and torsion springs (used in mouse traps). Roughly one-third of Ace’s business is from wire forms, Linda Froehlich said. A wire form is a single wire bent into shape. A wire fabrication is a number of wire forms bent into shape and then assembled together, like a basket. A compression spring is designed to squeeze together and resist compression when loaded, and then expand back to its original length when the compressive force is reduced, such as a shock absorber. An extension spring is designed to expand when force is applied, and then to shrink back together when the force is reduced. Imagine a screen door opens, for example, and then the extension spring pulls the door closed. Torsion springs are used on clothes pins and on mouse traps. Two arms, in those cases, protrude out from the sides of the central spring and they rotate around the spring’s axis. 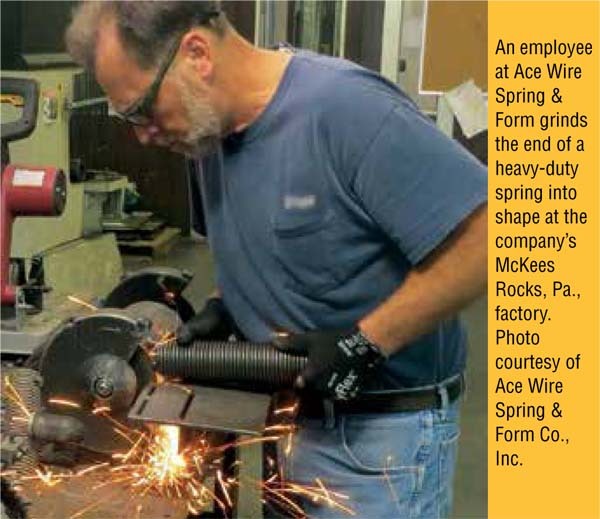 In addition to wire forming and spring manufacturing, Ace also offers its customers numerous secondary operations to make itself a one-stop shop. Those include cadmium plating, zinc plating, passivating, nickel plating, black oxide coating, electro polishing, powder coating, and Dykem® staining. Ace also offers painting, burnishing, grit blasting, heat treating, DACROMET® coating, assemblies, hardware, and shot peening that complies with numerous military specifications and procedures. Ace supports Manufacturing Day, a day across the country when thousands of parents, students, teachers, and others visit local factories. The day, supported by both industry and the U.S. government, is designed to encourage young people to consider manufacturing as a job. As an older generation of fabricators from the Baby Boom generation retire, openings are being created in manufacturing that aren’t being filled. Most manufacturing firms are looking for people to hire. Froehlich invites visitors to the McKee Rocks, Pennsylvania, plant every year for Manufacturing Day. Froehlich said Ace asks parents to talk to their children about modern manufacturing.